President Ram Nath Kovind appointed Brig. (Dr.) B. D. Mishra (Retd.) as the Governor of Arunachal Pradesh, Satya Pal Malik as the Governor of Bihar, Jagdish Mukhi as the Governor of Assam and Ganga Prasad as the Governor of Meghalaya. Former member of Bihar Legislative Council Ganga Prasad has been appointed as the Governor of Meghalaya. Jagdish Mukhi will take the place of Banwarilal Purohit as the Assam governor. Banwarilal Purohit appointed as the governor of Tamil Nadu . Satya Pal Malik, former MP and BJP’s national vice president, has been appointed the governor of Bihar. 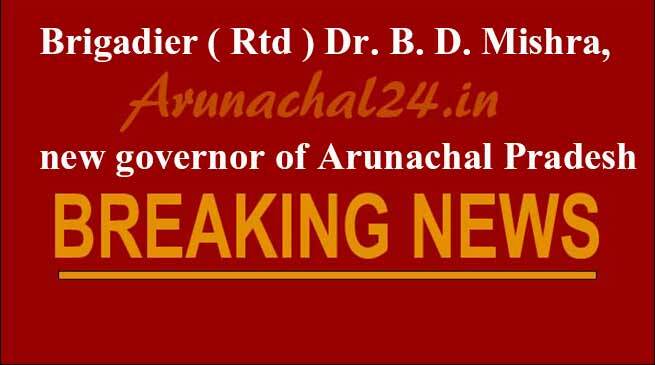 Admiral (Retd) Devendra Kumar Joshi will be the Lieutenant Governor of Andaman and Nicobar Islands in place of Mukhi, a press release issued by the president’s office said. Dr. B. D. Mishra retired from the Indian Army on July 31, 1995 as Brigadier, after an illustrious career in the Forces, beginning as a permanent regular infantry officer, on December 17, 1961. He was born on July 20, 1939. Dr. Mishra was the Commander of NSG (Black Cat Commandos) Counter Hijack Task Force that assaulted the hijacked aircraft of Indian Airlines and successfully executed the rescue operation, at Raja Sansi Airfield, Amritsar, on April 24, 1993. All 124 travellers and crew members were rescued in the operation, after eliminating the hijackers, without any casualty or damage. Dr. Mishra received the Prime Minister’s appreciation for his role in ending this hijack crisis. He has received Commendation for Gallant Role in Counter Terrorist Operations. Dr. Mishra holds an MA from Allahabad University, an M.Sc from Madras University and a Ph.D from Jiwaji University, Gwalior. He has five years’ Post Graduate and Graduate level teaching experience in College of Combat at MHOW and in Defence Services Staff College at Wellington. Pul Order to Stop Sending Teachers on deputation to other Departments.